Nothing like shooting out 4 big ole' pizzas and having hardly any left for leftovers the next day. It's a good feeling when my food gets eaten up and I get compliments saying how yummy it was. 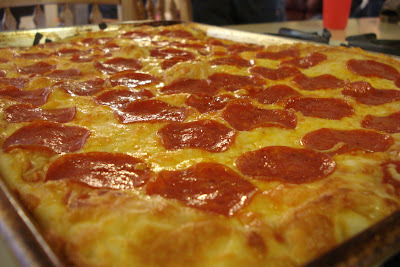 :o) This pizza dough is the easiest to throw together and with the best results. 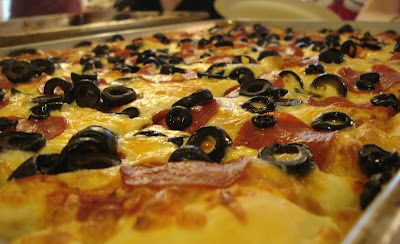 I seriously prefer these pizzas over any pizza place in this little town. The recipe makes 2 big sheet pans, but I had to feed 10 adults and 8 kids, so I doubled the recipe and 4 sheets was perfect! 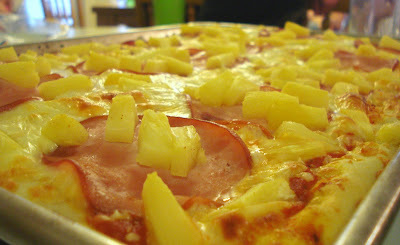 I made a pepperoni, pepperoni and olive, meat lovers, and hawaiian. I think next time I'm gonna try a chicken bacon ranch or something fancy. In a small bowl add water and yeast together and let it sit about 10 minutes or until it's good and bubbly. In your mixing bowl add your flour and salt and stir to combine. Slowly pour in olive oil while your stirring. Stir until oil is incorporated. Gently stir yeast mixture and pour into flour mix. Mix until it forms a ball. Drizzle a big bowl with olive oil. Throw in dough and roll it around to coat your dough. Cover with saran wrap and let rise somewhere warm for 1-2 hours or until doubled in size. Drizzle 2 big sheet pans with olive oil. Divide dough in half and spread each half out into pans. You might not think it's gonna spread all the way but it does. It is a thinner crust. 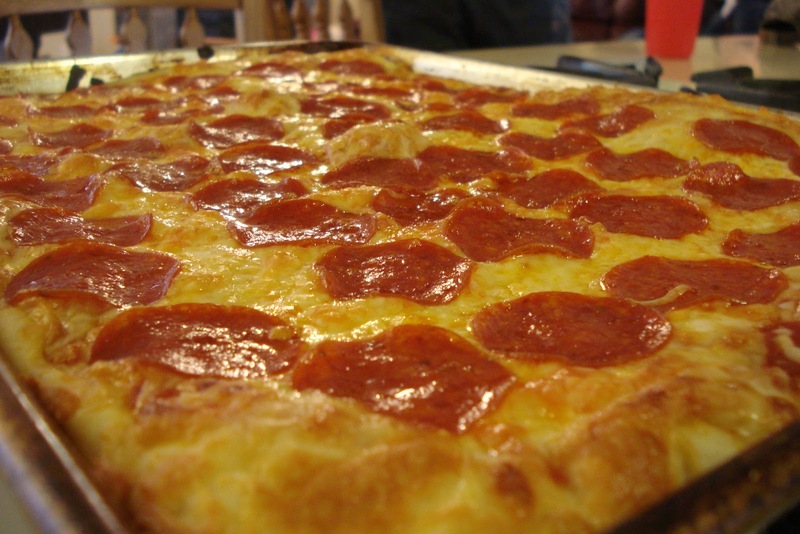 Top with pizza sauce, cheese, and your favorite toppings and throw it a preheated 500 degree oven for 10-12 minutes or until edges of dough are golden brown. DELISH!! Dough can be refridgerated for up to 3 days after it's made, or if you wrap it up good and tight it can be frozen for up to 6 months!! So that's a plus too!! I've had this made by Erica. It's deeeeelish! We could have used one more sheet too. :) Great recipe. There's nothing like homemade pizza! Looks yummy!! This recipe is similar to my pizza dough and we LOVE it!! My husband would LOVE to come to your house and eat when you do something fancy. I have a ranch aversion when it comes to anything but salad.. he claims that I am "boring"..
Do u need to proof the yeast with sugar ?? Breakfast Casserole...Happy St. Patty's Day! !